A woodshed is a smaller secondary building on a property used for storage (e.g. of firewood or garden tools), or as a workshop. It can either be attached as a lean-to to a house or it can be separate building, e.g. in a back garden. Tradtionally it was used for dry storage of wood for the fireplace, hence the origin of its name. Woodsheds have sometimes been used as places to give a naughty child a sound spanking. This is mainly due to the loud noise that comes with such a punishment, which would otherwise disturb (and get the attention of) everyone in the house. Unlike the open air, a woodshed provides some privacy. It is comparable to a basement or attic as a place for punishment. 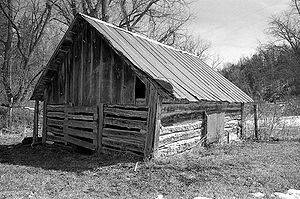 The woodshed, particularly in rural areas, is so strongly associated with punishment that the mere mention of its name can have a strong psychological effect. A child threatened with "a trip to the woodshed" is immediately aware of the consequences of misbehaving without the need to say anything more. In the adult world, the colloquial expression: "taken out to (or behind) the woodshed" refers to a humiliating defeat (as in sports, politics, etc.) or harsh criticism analogous to suffering a physical beating from a superior force or individual. The woodshed is stereotypically used only for father/son spankings. A spanking in the woodshed is sometimes called a woodshed treatment. A woodshed spanking would usually be given on the bare bottom with an implement such as a belt, strap, stick, switch or paddle. Going to the woodshed often was a sure sign that a more severe punishment was due than the usual minor punishments that are given on the spot in the house. Woodshed punishments are common in spanking novels and spanking stories, usually in M/m or M/M scenarios, occasionally also in M/f or M/F scenes. Sometimes objects found typically in a woodshed are used as aids in giving the punishment, such as a sawhorse or a log of wood on a sawbuck, over which the spankee can be laid (and possibly, tied onto). The woodshed was also sometimes used as a place for arrest or time-out. In this usage, the child would be locked in the woodshed for a period of time. In Astrid Lindgren's Emil of Lönneberga novels and TV series, the title character Emil would stereotypically escape his choleric father by running into the woodshed and locking the door from the inside. The door had an outside lock as well and his father would make him stay in there for a period of time as punishment for his pranks. The woodshed is portrayed as a place for punishment in a number of mainstream movies. Perhaps the most well known is Of Human Hearts (1938) with Gene Reynolds taken to the woodshed by Walter Huston. Penrod and Sam (1931), a boy gets a belt whipping from his father (YouTube clip). Pretty Baby (1978), an unruly Brooke Shields is taken to the woodshed for an audible off-camera thrashing. The Little Kidnappers (1990) is a telefilm with Charlton Heston; he drags a boy out to the woodshed for a severe switching. The strokes are heard by the people in the house but not seen. Caned in the Woodshed (Spanking Sarah), Sarah gets paddled and caned. 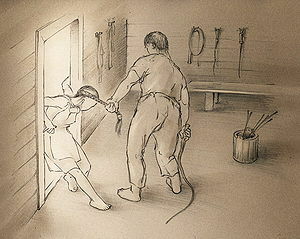 The Schoolmaster's Revenge (Spanking Epics), set during 1914, includes a woodshed spanking. Uncle Wayne's Woodshed Whippings (Raven Hill Studios), is a traditional M/F spanking video in a rural setting. Woodshed Discipline (Nu-West/Leda Productions), two bad girls get leather strap beatings. Russian Woodshed Spanking is a CP video producer. The Old Russian Woodshed and its sister site The New Russian Woodshed makes severe CP videos with emphasis on whipping. Southeastern Woodshed (website), F/F and F/M spanking features. Woodshed is also the name of an M/M spanking magazine, see Woodshed (magazine). Bethany's Woodshed is a spanking story pay-site founded by Bethany Burke, a writer of spanking stories and novels. She also writes and directs fetish films produced by Spanking Epics. The Best of Bethany's Woodshed is a sister site with full-length e-book spanking novels that are no longer available at Bethany's Woodshed. "Just a minute", vintage cartoon postcard (c. 1910). Dodd gets a strapping, by Marilla Thackery (2017). Trump meets the strop, by Marilla Thackery (2017).